Ristorante Terrazza del Casino dei Nobili is the new sibling of the justifiably popular Ristorante Pizzeria Casin dei Nobili near Campo San Barnaba. 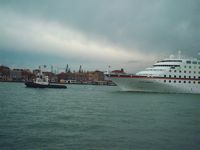 It has a splendid position, with a terrace on the Zattere waterfront to greatly increase its capacity, and give you the opportunity to eat al fresco and watch the never ending variety of water traffic on the Giudecca Canal, including the occasional ten-story cruise liner to add drama. The inside has its attractions too, though, completely remodeled since its days as the pleasant but basic pizzeria Sole e Luna. Simple white linen and walls are brightened by lots of colourful artwork and service is friendly and efficient – our waiter Adriano was courtesy itself. And this is one of the few restaurants in Venice that serves food late – the kitchen closes at 11 pm. The menu is good and offers lots of interesting dishes. Sformatino di melanzane con pesce spada e scamorza affumicata (€10) was excellent and I’d also like to try the misto di saor alla Veneziana (€14) – the sweet and sour treatment most traditionally given to sardines can be very good with other fishy things. The bread, always a good test of how much a restaurant cares, was superb and dense – it’s made from pizza dough. Primi are good value from €10, with risotto di pesce €15 for two. Secondi are a varied mix of fish and meat. Filetto d’orata (sea bream, €14) was very good, just cooked, and the baby artichokes (castraure) that came with it were fabulous; the other option was fried leeks.Filetto di San Pietro al prosecco con zucchini fritti sounded good too, but I chose tagliata d’anatra con caramellata al miel con spek croccante (€15). The duck could have been a touch pinker but it was very tender, and the crunchy bacon in the sweet sauce was quite delicious. There is also a good range of pizze at €6-10. Dolci (€6) are tempting – semifreddo di pistachio e amaretto is heavenly. The wines are mostly local and there’s a wide choice of Sauvignon blanc, our current preference – a bottle of Chiòpris from Friuli was €20. Not surprisingly in this location there were plenty of tourists dining, but also plenty of Italians. There was a huge Italian family party next to us, including four children under five, all behaving perfectly, some occasionally being excused to run around outside the vast picture window that’s useful for more things than just watching the passing traffic, waterborne or on foot. We’re delighted to have this new restaurant a stone’s throw from our habitual hotel and it will certainly become a regular fixture in our diary.